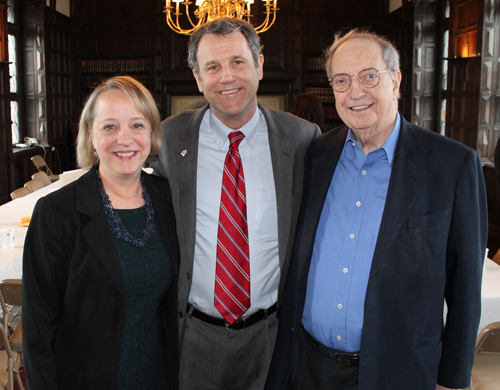 Global Cleveland hosted a roundtable discussion on immigration reform with Senator Sherrod Brown on Monday April 15, 2013. Leaders from various communities gave their thoughts 'from the front-line' and the Senator listened carefully, asked questions and took notes. Here are a few snippets of the conversation. Albert Ratner began the discussion by saying we have both moral and business reasons for reform. When Cleveland and the Midwest was booming we had 20% or so foreign-born. With Cleveland at 5% foreign-born, we have problems. He cautioned that even though our region has water, if our population keeps dwindling we will lose more congressional seats and not have the votes to protect our water. Immigration attorney David Leopold said that people are symptoms of the problem, not the problem. Attorney Jose Feliciano stressed that Cleveland needs population and that many jobs need filling. Radhika Reddy of Ariel International told how she needs to hire low skilled people but there is a disincentive to work in the current system. The benefits received by not working exceed the $9 minimum wage so many find it better not to work. These individuals cost the federal government $21,000 per year in benefits. 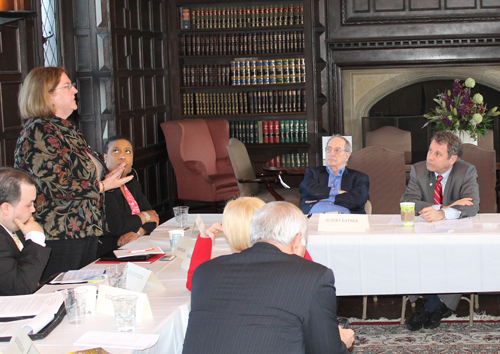 CWRU's Dave Fleshler said that this issue effects institutions such as universities as well. Without immigrant talent, Fleshler said that some departments would close down. Dan Hanson of ClevelandPeople.Com worried that the new proposal might sacrifice some of the family-based immigration to grow the employment-based immigration category of high-skilled and educated. He stressed that Cleveland needs a lot of people - of all skill levels. Ingrid Angel of El Barrio agreed saying that companies need people and that we need to connect the non-profits to community colleges. Juan Crespo told of some bad treatment of undocumented people. Elizabeth Hijar is a daughter of Mexican immigrants and said that the H-1B needs to be easier for small and medium sized companies. She also said quota limits should be removed. Sheila Wright, executive director of the Cleveland NAACP, said we need to let people know that immigrants will improve the economy and create jobs. Senator Brown asked how since low income workers have heard this before. Marsha Mockabee, President & CEO of the Urban League said that the message has to show that it's a supply and demand issue. We need to raise the bar. Stanley Miller stressed the moral imperative and said we need all levels of people. Amy Kaplan of the Jewish Federation said it's moral and economic. We need a vibrant community to get our young people back so, for example, that there is a large enough Jewish community to continue the philanthropy. Senator Brown told of all the hate mail he receives on this issue. People are afraid that they will lose their jobs. It is a very important issue that inspires passionate opinions and we thank Global Cleveland, Senator Brown and all the participants for working toward a solution.